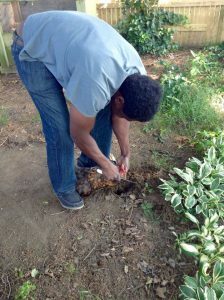 I celebrated the 4th of July by helping to kill a chicken, thereby invoking my freedom to further opt out of the Factory Farm Industrial Complex and become more self-sufficient. Actually it wasn’t intentional but just coincidental that it happened on the 4th—well the 3rd—of July. The plan had been in the works for a while. A neighbor had a chicken that had decided, in chicken menopause, that it would start crowing like a rooster. This was a problem because we live in a densely-populated residential neighborhood, and one complaint from a sleep-deprived neighbor could have cost her all her chickens. She asked me if I would help. I’d never killed livestock before, but it’s something I’ve wanted to participate in. Wanting to more be part of my food production, if I’m going to eat meat I want to be part of the process, etc. etc. etc. I considered just looking it up on YouTube for about five seconds. I wanted to do it with someone who knew what they were doing; my fear was that I would botch the job and end up prolonging a traumatic, painful death. Since I’m all about being humane, that potentiality didn’t settle well with me. Discussing this with other neighbors led me to find out that a friend and neighbor of ours, Prof, was skilled in the art of chicken killing and would be willing to help. Prof grew up in Ghana and had been processing livestock since he was a kid. So we met at our neighbor’s house with a sharp knife and a bucket of boiling water. The actual killing of the chicken was a one-person job that I didn’t participate in. Prof captured the chicken from the coop, expertly held her in a way that made her sort of catatonic. He brought her over the small hole he’d dug in the ground, kept her head back, and made a small incision in her neck. 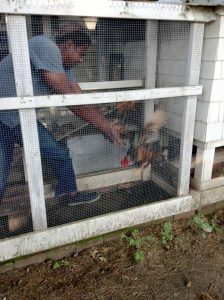 He held her down as she bled out; the chicken didn’t react at all, save for a few spasms, contained by Prof’s holding of the animal. It was over quickly. We took the still chicken to the pot of boiling water, and placed it inside. The hot water loosens the feathers so they are easily removed. “Yes.” So, years ago with the geese, as last week with the chicken, I defeathered. If the water’s good and hot, the feathers just slide right out. When you get down to the smaller, tougher feathers, you need to pick and pull at them more. It’s the sort of meticulous work that’s highly rewarding; by the end, your hands are cramped but you’ve got something to show for it. After the chicken was skin-bare, Prof sliced off the head, and finishing draining the blood. Then he dismembered her, saved the edible organs, and put it all into a stock pot for me. I’d promised to make a broth with the chicken—which was otherwise inedible, at her age—that my and Prof’s families would share. I took great care to make a rich, fatty, gelatinous broth, à la this chicken broth recipe from Fearless Eating. 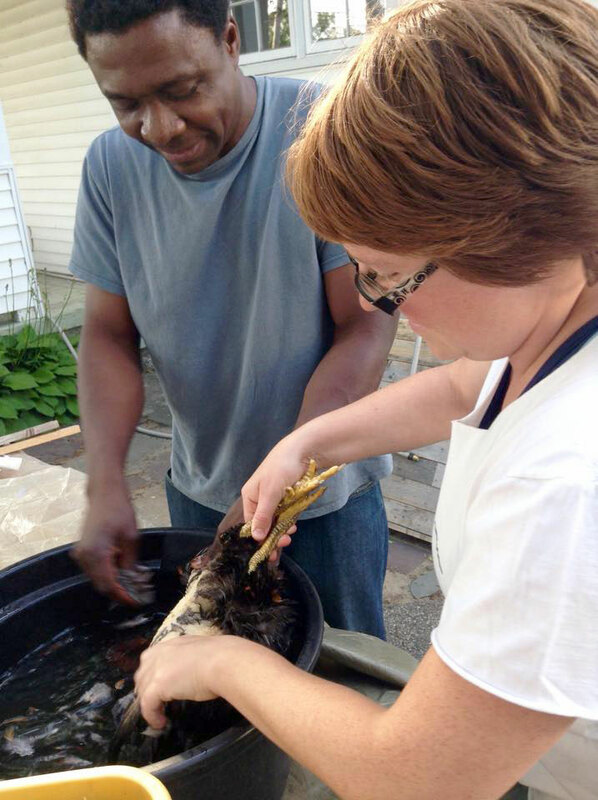 Prof was grateful to me when I made him the broth, and I am grateful to him (and to our neighbor) for providing the chicken to make the broth, and for a great learning experience! Awesome! I hate to do the killing too. Had to put down my two beautiful goats (two different times, both had cancer – very sad. My son did the shooting; it was awful. You are an inspiration, Vanessa. Annie, thank you so much for your comment! I’ve never had livestock before–being a city slicker :)–but I imagine it would be much harder when you’ve gotten to know the animal. It’s helpful and humbling to hear from someone like you who has more experience. I’m not sure if I’ll ever be a position to have livestock myself, but that is one of my dreams, and I think it’d be good for my son to be around that as a child. Yes, I agree. The earlier a person experiences these things the easier it is to accept. If we are going to eat meat then it’s probably a good thing to get close to the source. And good too to be able to control the quality. My duckies get to free range all day eating grass, weeds and lots of bugs. Even though I have dug them a small pond there are no mosquitos out there because they go after the larvae (snip snap, down the hatch!) I supplement their foraging with organic poultry feed. I hope you get to raise something sometime; it’s a lot of work and a lot of beauty. There’s hardly anything as cute and soft and funny as a baby goat. (and the milk is fabulous) Your boy would be enriched by raising his own farm animal. I’m a bit of a city-slicker too; at least I jumped into this stuff without any prior experience. We bought a couple acres and just had to do something with it. There you go.